DALLAS – Nov. 27, 2018 – UT Southwestern researchers have found that an enzyme on the surface of some lung cancer cells helps feed the cancer, making it a tempting treatment target. The enzyme, transmembrane serine protease 11B (TMPRSS11B) is described in a report published today in the journal Cell Reports. 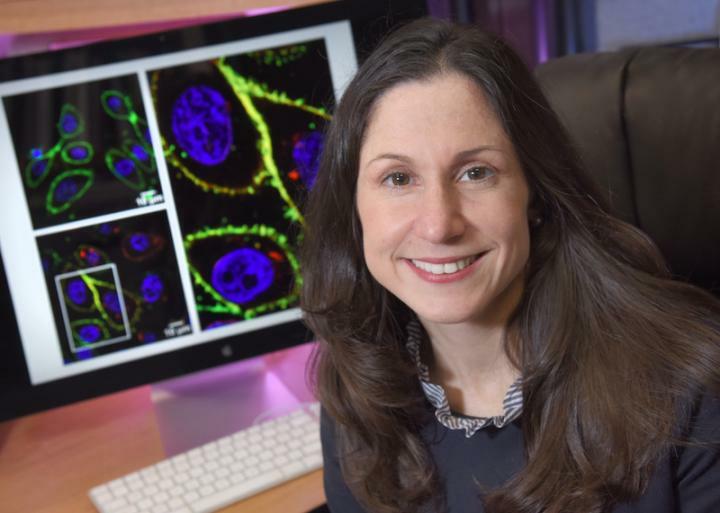 In addition to being found in squamous cell lung cancer and prostate cancer, the enzyme also has been identified in squamous cell head, neck, and cervical cancers, said Dr. Kathryn O’Donnell, Assistant Professor of Molecular Biology. “In this study, we found that the enzyme strongly promoted the growth of certain types of lung cancer cells. We uncovered a new mechanism that expands our understanding of how cancer cells reprogram their metabolism to provide energy for rapid growth as they form tumors,” Dr. O’Donnell said. The research focused on TMPRSS11B’s ability to encourage the movement of lactate, a byproduct of cell metabolism long thought to be a waste product. Groundbreaking research last year from UT Southwestern Professor Dr. Ralph DeBerardinis’ laboratory found that, in fact, lactate provides fuel for growing tumors. Dr. DeBerardinis, a co-author on the current study, is Chief of the Division of Pediatric Genetics and Metabolism at UT Southwestern, Professor at the Children’s Medical Center Research Institute at UT Southwestern (CRI), and a Howard Hughes Medical Institute Investigator. “In TMPRSS11B, we have the perfect cancer drug target – it’s accessible on the tumor cell surface, it’s selective for cancer cells, blocking it both inhibits the cancer growth and sets the stage for developing better immunity against the cancer, and its presence makes it a diagnostic for which patients to treat,” added Dr. John Minna, a co-author on the study. The study received funding from the Cancer Prevention and Research Institute of Texas, the National Institutes of Health, the Sidney Kimmel Foundation, The Welch Foundation, the LUNGevity Foundation, the National Cancer Institute, and the Howard Hughes Medical Institute.